CARBONDALE, Ill. — Southern Illinois University Carbondale served as the launch pad for Clara Kridle’s successful accounting career, so when her colleagues created a memorial scholarship in her honor, they and her family chose to help propel future Salukis toward successful careers in the world of business by establishing the Clara J. Kridle Memorial Scholarship Endowment. “We are triply blessed to honor Clara Kridle through this memorial scholarship,” Terry Clark, dean of the College of Business, said. “We are honored because she was one of our own, who came to us and blossomed into a young professional, ready to take on the world. Clara J. Rigoni Kridle, originally from Lombard, completed her bachelor’s in accounting degree at SIU in 1980 and initially worked for Blue Cross Blue Shield in Chicago before joining what was then known as Coopers and Lybrand in 1984. Through subsequent mergers, the firm went on to become Pricewaterhouse Coopers (PwC). A CPA, she became a principal of the firm in 1997. Kridle, of Naperville, passed away on May 9, 2017. The PwC Charitable Foundation Inc. has now established the scholarship at SIU’s College of Business in her honor and in recognition of her 33 years of service to their firm. In presenting the $150,000 memorial scholarship endowment, the PwC board of directors and principals recognized Kridle not only for her “considerable contributions to the success of the firm,” but also noted that she was held in high regard by her clients, partners and staff, was a leader in mentoring and coaching, exemplified partnership and teamwork and was patient and sought after for advice and help. The Kridle family’s affiliation with SIU has several layers. Clara and husband Kevin, also a 1980 graduate in journalism, first met at the university. They were friends on campus, living in the same apartment building and enjoying long talks when they ran into one another in the hallway. A few months after graduation, the two happened to meet on the street again in downtown Chicago; Kevin was working as an executive for a publishing company located near her employer. He was actually dating someone else and didn’t score points with his girlfriend by promptly comparing Clara to singer/songwriter Carly Simon, a likeness Clara heard about throughout her life. Soon they were dating, then married and the parents of two children – Kristen and Nickolas. Kristen is also a graduate of SIU, completing her marketing degree at SIU. She is now an assurance associate for PwC in Oregon. Nickolas is a recent graduate of Indiana University and works in the corporate office of Ford Motor Company in Texas. The Kridles have lived in Naperville for 31 years, raising their children there and being active in the community. Clara Kridle freely gave her time and assistance both at her workplace and in her private life, Kevin said. She served on the board of directors of CARA, an organization that helps people affected by poverty develop the necessary skills and confidence to obtain jobs; was on the community advisory board for Loaves & Fishes Community Services, an anti-poverty, hunger-relief agency; and was active in her church and supportive of Sharing Connections, an organization that connects families in need with gently used furniture and household items and at which her children volunteered. At work, too, she cared deeply for her associates, focusing not just on her own success, but mentoring colleagues and doing everything she could to help them succeed, Kevin said. In fact, he said he truly came to realize the profound affect she had had on those around her during the six months she was ill and after her passing, as there was barely a day that went by during which someone didn’t reach out and tell via notes, calls, emails, texts, letters, flowers or other means how much Clara meant to them. He said he and her children are touched and appreciative to PwC for honoring Clara with a scholarship, which he’s sure she would be surprised and humbled by. The endowment from PwC calls for award of a scholarship each year to a junior or senior Illinois business student with a GPA of 3.5 or above and who has demonstrated financial need. The recipient will also have a history of community service or involvement in an initiative illustrating their social responsibility. Juniors who receive the scholarship can reapply for their senior year if they continue to meet the requirements. Plans call for the first scholarship award from the SIU Foundation in spring 2019. The College of Business also plans to posthumously present a Gary N. Parish Business Excellence Award to Clara Kridle in spring 2019. CARBONDALE, Ill. — A new podcasting lab, innovative uses of 3D printing, robots and artificial intelligence, and more are all coming to Southern Illinois University Carbondale thanks to the ingenuity of its faculty and support from the SIU Foundation. Ten faculty members are receiving inaugural research awards through the Foundation. The Faculty Research Award is designed to recognize outstanding work and research of SIU faculty, according to James Salmo, vice chancellor for development and alumni relations and CEO of the SIU Foundation. The SIU Foundation Board approved $50,000 to be awarded in the 2018-19 school year. A committee comprised with both foundation board members and academic leadership established award ranges and selection criteria. By early October, 67 grant proposals were received and reviewed. Meera Komarraju, interim provost and vice chancellor for academic affairs, noted that the criteria for the proposals were innovation, leadership and student success. The research grants generated proposals from tenured and tenure-track faculty from nine colleges on campus. “The quality of the submissions was outstanding and awardees were recognized at a joint lunch hosted by the SIU Foundation and SIU Alumni Association. 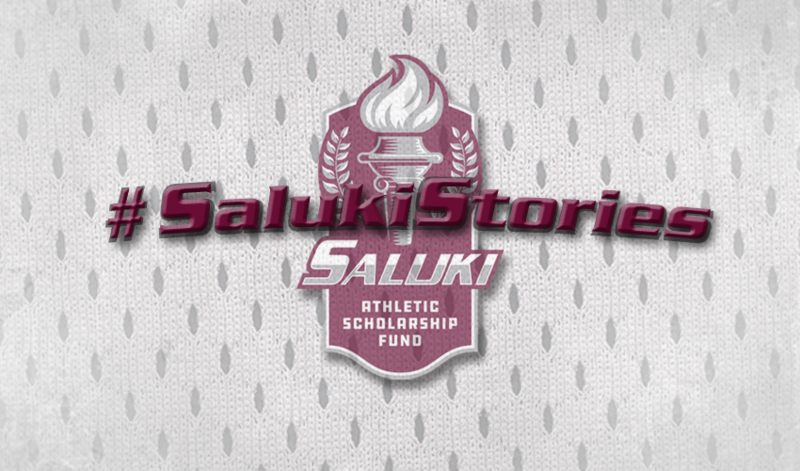 We appreciate the SIU Foundation’s decision to provide a similar grant next year,” she said. 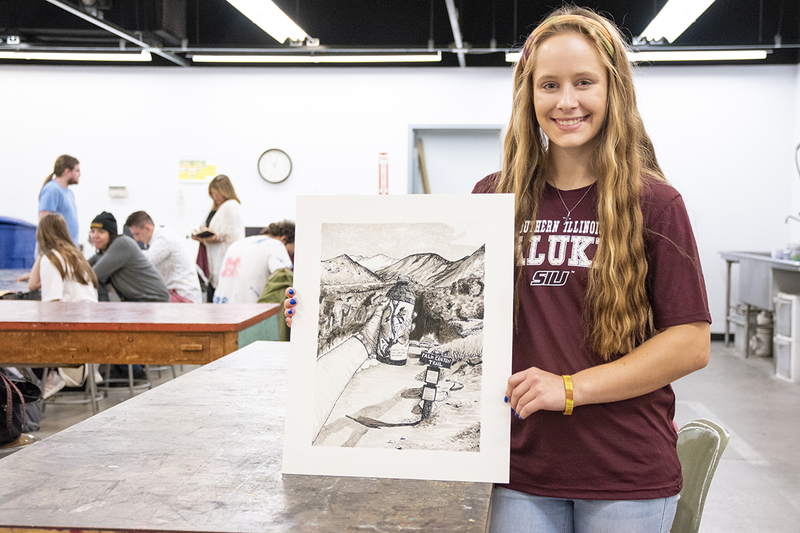 Leah Sutton, a freshman in Art History is a third-generation Saluki from Highland, Illinois. Sutton received the SIUC Talent Scholarship, which is awarded to an incoming student, on a basis of portfolio review. Sutton is thankful for the scholarship as it will provide more money for her family to save up for her younger brother to also enroll at SIU. “My little brother is a freshman in high school and he is an avid fisherman. He already knows what he wants to be, which is to get an engineering degree so he can design fishing equipment,” she said. Sutton is thankful for the scholarship and hopes more donors will give so that students like her can get a quality education. CARBONDALE, Ill. — The Saluki Athletic Scholarship Fund announced on Wednesday that James (Jim) Rosser, a three-degree alumnus of SIU (B.A. 1962, M.A. 1963, Ph.D. 1969) and the SIU Athletics Campaign Chair for the Forever SIU campaign, has established the Dr. James H. Rosser Men’s Basketball endowed scholarship. Rosser was a member of the Saluki Men’s Basketball team from 1960-62. During his distinguished career in higher education, Rosser served as president of California State University, Los Angeles, from 1979 to 2013, and was named president emeritus in 2013. Prior to becoming president at Cal State Los Angeles, he was the vice chancellor of the Department of Education of the State of New Jersey. Earlier he served on the faculty at Southern Illinois University and founded the SIU Black American Studies program in 1968. Rosser was a recipient of the Alumni Achievement Award in 1982, the Distinguished Alumni Award in 1999, and an Honorary Doctor of Humane Letters degree in 2003. In addition to the men’s basketball endowed scholarship, Rosser previously endowed the James H. Rosser Scholar-Athlete Scholarship at SIU. Rosser knows the importance of athletics and the development of student-athletes on and off the field. For those reasons, he continues to the importance of the Forever SIU campaign. Rosser’s leadership and endowed scholarship will continue to support the Saluki Athletics Scholarship Fund (SASF), which helps cover scholarship costs for 350 student-athletes in 17 intercollegiate sports. “What he has done for our university and our athletics department – he’s someone who has a true love for SIU,” Kill said. Dr. Tom Miller working with third-year medical student Nahayo Esperant-Hilaire during his preceptorship Tuesday, October 17, 2017. Forty-eight years ago, forward-thinking leaders at SIU developed a plan to start a medical school to train young doctors who would provide health care for the people of central and southern Illinois. 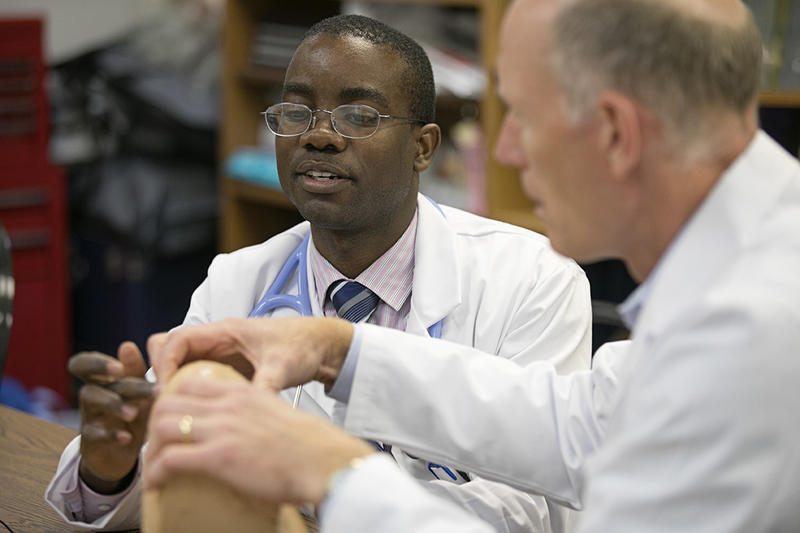 SIU School of Medicine has far exceeded its original goal with thousands of physician assistants, graduate students, MEDPREP graduates, residents and fellows joining the more than 2,800 physicians who were educated at SIU. Medical education is ever-changing, and SIU is leading the next generation of health care providers and researchers. Philanthropic support continues to drive the school’s mission forward. This financial assistance is imperative to expansion of student scholarships, development of new, exciting programs, the recruitment of top-notch faculty and the ability to keep pace with ever-evolving technology. While cost of tuition at SIU School of Medicine remains one of the most affordable among public universities, these medical students graduate with significant debt – more than $210,000 on average – according to Erik Constance, MD, Associate Dean of for Admissions and Student Affairs. “Scholarships are imperative for fulfilling our mission of sending well-trained providers in central and southern Illinois,” Dr. Constance says. And SIU’s other learners are in great need of support too. 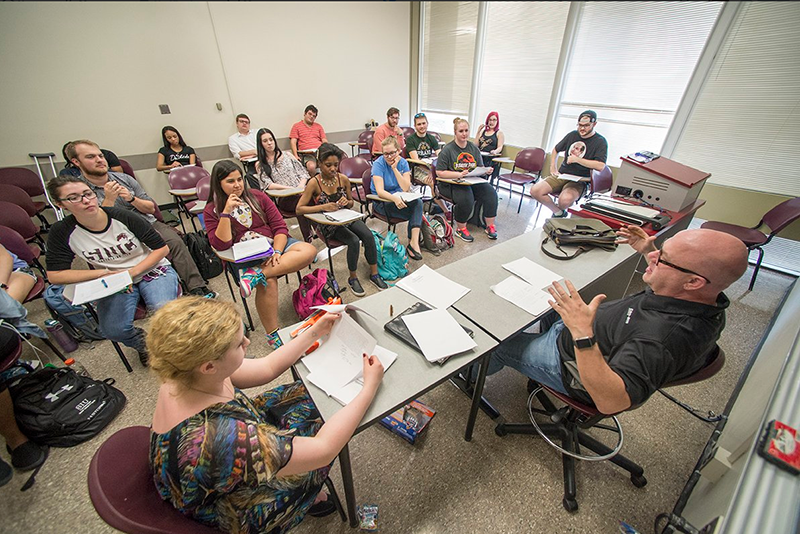 SIU’s MEDPREP students come from socioeconomically disadvantaged backgrounds. They are often paying off debt from their undergraduate education while also paying for two years of MEDPREP. With medical or dental school education on the horizon, the financial burdens can greatly impede their academic success. To remain competitive with other physician assistant (PA) programs, SIU’s highly successful PA program has higher tuition rates than other SIU graduate programs. The tuition combined with the additional cost of supplies such as a diagnostic kit, stethoscope, reflex hammer, tuning fork and textbooks, make scholarship support crucial. The Medical Student Resource Fund helps fill in the gaps left by other funding sources. Generous alumni and friends have funded the purchase of teaching materials, vital medical resources, clinical clerkships, gym memberships and the remodeling of student lounges. You don’t have to be a billionaire to create a lasting legacy for our learners. Whether you want to make a one-time large gift or multiple small gifts over time, every gift helps our learners succeed. To learn more about the Forever SIU campaign, visit www.foreversiu.org. To learn more about the SIU School of Medicine, visit www.siumed.edu or call 217-545-2955.